Members of the genus Australopithecus (which are often referred to as "australopithecines" or "australopiths") are undoubtedly bipedal and some of the species are considered direct ancestors to humans. Like the earliest hominins, australopiths and their descendents Paranthropus are only found in Africa (Figure 3.8). Thanks to the enormous fossil record of australopiths, with thousands of specimens including nearly complete skulls and skeletons, much is known about the genus. Australopiths all share general features of the skeleton. They are smaller-brained than modern humans, at about half the size similar to chimps and gorillas. Adults were about 3-3.5 feet tall. They resembled upright-walking chimpanzees and may or may not have manufactured stone tools, but like living chimpanzees and gorillas they probably frequently used tools. Australopiths are mainly known from cranial and dental fossils. The bones of the skull behind the eyes show very strong constriction ("postorbital constriction"), which makes room for large chewing muscles (the temporalis muscles) that attach from the jaw to the top of the head. Humans have very small chewing muscles and no postorbital constriction. Australopith faces are prognathic and the greatest breadth of the skull is at the base, toward the neck, unlike humans whose round skulls are widest up high (Figure 3.7). Figure 3.8 The human (H. sapiens) maxilla (upper jaw) shows the dental characteristics that distinguish H. sapiens from chimpanzees and australopiths including small vertical incisors, small flat canines, no diastema (gap) by the canine, flat molars with low round cusps, and curved tooth rows. The chimpanzee's (Pan troglodytes) upper jaw is similar to what we expect the teeth and jaws of the earliest hominins to resemble. Notice the large, spatula-shaped incisors, large pointed canines, straight parallel tooth rows, and large molars. A. afarensis shows traits that are intermediate between chimpanzees and humans. Illustration by JeffDixon. have thick-enameled molars with bulbous cusps anchored in their thick, bony mandibles. Australopith body size is in the range of modern chimpanzees with a high degree of sexual dimorphism. They had human-like grip capabilities evident in their hand bones. It is debated whether or not australopiths were still adept tree-climbers or if they were obligatory bipeds because they retained some arboreal features like a funnel-shaped thorax, long curved hand and foot phalanges, relatively short legs, relatively long arms. But they also have evidence for bipedality like the distinct foot strike pattern (as evident by the Laetoli footprints in Tanzania), a broad flared ilium, a carrying angle to the femur, a foramen magnum tucked under the skull, a less thumb-like big toe that is more in line with the rest of the toes. There are four species of Australopithecus that are generally agreed upon by most researchers. The genus Australopithecus arose in the Pliocene as early as 4.2 Myawith Australopithecus anamensis and lasts until about 2.5 Mya with Australopithecus garhi, a species that overlaps with the origin of our own genus Homo. Three of the australopith species are found in East Africa and one, A. africanus, is found at cave sites in South Africa. It is important to note that the caves in South Africa that hold aus-tralopiths, Paranthropus, and some specimens of early Homo contain no evidence that the hominins were occupying those caves. Instead it appears as though their bones accumulated, just like the bones of other animals, by falling through the crevices and gaps of the ground into underground limestone caves. Carnivores, like leopards, and large birds of prey are blamed for many of these bone accumulations because they tend to use trees that grow near their openings. These are the same kinds of caves, formed by ground water dissolving the bedrock, that are common in America and that can eventually form sinkholes. Although nonhuman primates, like baboons, have been observed seeking shelter in caves, real evidence of human cave occupation does not occur until the middle Pleistocene with Archaic humans. The oldest australopith is A. anamensis. Fossils of A. anamensis date between 4.2 and 3.8 Mya and come from Kanapoi and Allia Bay, Kenya, and Asa Issie, Ethiopia. Today the Kenyan sites are located near the shore of the southern tip of the large Lake Turkana. At various times in the past, parts of the lake were greatly reduced and these sites were located in what were once deltas and floodplains of the ever-changing landscape. When the first fossils of A. anamensis were discovered by Meave Leakey, Kamoya Kimeu, and Alan Walker in the mid-1990s, they were the earliest known bipedal hominin fossils. The mandible from Allia Bay is u-shaped like an ape. It has a large bony buttress at the mandibular symphysis (i.e., the joining of the two halves of the jaw, right under the incisors) to protect it from breaking like a wishbone during chewing. It has larger teeth than chimpanzees and later A. afarensis. A. anamensis shows gorilla-like sexual dimorphism in canine size and body size. There is a single fragmentary humerus from Kanapoi that lacks the knuckle-walking morphology ofAfrican great apes. The radius is longer than even the longest chimp radius. The tibia is oriented at the ankle like modern humans, strongly indicating bipedal locomotion was used. Further evidence that A. anamensis fossils do not belong to the chimpanzee lineage comes from the skull near the ear where the hole for the chorda tympani (the facial nerve for taste) passes through the bone differently than it does in chimpanzees. The teeth and bones of A. anamensis are very similar but look primitive in comparison to later A. afarensis. Therefore, A. anamensis is widely considered to be ancestral to A. afarensis. The australopith with the richest fossil record is A. afarensis and the best-known specimen is a partial skeleton affectionately called "Lucy" (AL 288-1). She was discovered by Donald Johanson in 1974 at the site of Hadar in the Afar region of Ethiopia and she dates to about 3.2 Mya. An estimated 40 percent of her skeleton is preserved if her missing hand and foot bones are not included. In another spectacular find at Hadar, several individuals were discovered that died together 3.2 Mya and this group of A. afarensis is called The First Family because it confirmed that the species lived in social groups, but the cause of death is still unclear. A. afarensis lived from approximately 4 to 2.5 Mya in an area stretching from Ethiopia to Tanzania to Chad. A. afarensis fossils are found at sites that were once predominantly open and dry savannahs and woodlands. Cranial capacity ranges from 400 to 500 cc and adult body masses average 29 kg for females and 45 kg for males (about 60 and100 lbs respectively). Males had nearly twice the body size of females much like modern gorillas. They had long arms, short thumbs, and curved fingers and toes. The teeth have some ape-like characteristics, including large pointed canines, and a small diastema in the lower jaw to accommodate the upper canines. The molar cusp patterns are intermediate in character between apes and humans and the cusps themselves are low and round like humans. Overall the teeth are smaller than in apes and the tooth row is not as parallel as in apes or A. anamensis (Figure 3.9). The postcranium of A. afarensis is characterized by ape-like traits like short legs, long arms, and a funnel-shaped chest. But it also had humanlike adaptations for walking upright like a more bowl-shaped pelvis and less curvature in the fingers and toes than apes (although still curved). This mixture ofape-like and humanlike features is what make A. afarensis the classic link between apes and humans—a true bipedal ape. However, exactly how arboreal this species remained is still debated. 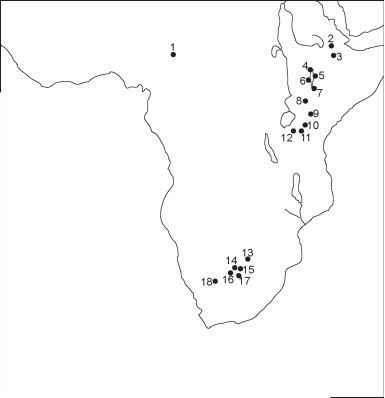 Figure 3.9 A map of sub-Saharan Africa shows sites where early ho-minins have been found. Illustration by Jeff Dixon. evolved in A. afarensis. There is a well-preserved knee joint (the end of the femur and the matching top of the tibia) from a specimen at Hadar, the same site that produced Lucy, which clearly shows the angled knee of a biped (Figure 3.6). Footprints attributed to A. afarensis also show evidence of advanced bipedalism. At the site of Laetoli, Tanzania, a trail of hominin footprints is preserved in a hard ash layer which is dated to about 3.7 Mya, within the time and geographic span of A. afarensis. Mary Leakey led the excavation of the footprints of an array of animals including rabbits and elephants. The hominin ones, which cross the path of a three-toed horse, resemble a modern human's. There is a depression for a strong heel strike just like a modern bipedal stride and there is also the appearance of an arch, something unique to the human foot that stores energy like a spring. However, the big toe is separated slightly from the rest of the toes. The name of this hominin literally means the "southern ape person of Africa" and is found at cave sites like Swartkrans, Sterkfontein, and Makapansgat in South Africa. A. africanus first appeared around 3 Mya and lived until about 2.5 Mya years ago in regions of open woodlands and grasslands. These hominins are similar to A. afarensis in the size and shape of their skeleton, and the difference in body size between males and females. The skulls, however, have rounder jaws, smaller canines, flatter faces (less prognathism), and none of the bony crests seen in A. afarensis or Paranthropus. Their faces display characteristic pillars on either side of the nose. In addition, their brains were larger—averaging about 500 cc. Because of their similarities with later hominins, A. africanus is often considered ancestral to early Homo. Figure 3.10 A map of the Old World shows sites where fossils of the genus Homo have been discovered. Not included are fossils sites bearing modern humans since those became widespread after 25 Kya. Illustration by JeffDixon. humanlike. Plus, the location of the foramen magnum shows that the skull sat directly on top of the body and suggests that the individual walked upright. The authenticity of the Taung find was not widely accepted until the 1940s when adult fossils with the same mix of characteristics were discovered. Further inspection of the Taung Child shows interesting features that are consistent with other australopiths. The frontal bone (forehead) recedes less than an ape, the deciduous ("milk" or "baby") canine is smaller like a human. Based on the schedule of tooth eruption it is estimated to have been about three or four years old. The body size, if extrapolated to an adult, would have been like a chimpanzee. The endocast was measured to be about 400 cc which, when grown-up to adult-size, would be about 450 cc. The postcranial skeleton of A. africanus shows clear adaptations to bipedalism. Sts 14, found in 1947, is a partial skeleton with the vertebral column, the pelvis, and part of a femur from Sterkfontein, dating to about 2.5 Mya. The vertebrae show clear adaptations for bipedalism and it has a humanlike bowl-shaped pelvis. Recently Ron Clarke discovered an astonishingly complete skeleton in Sterkfontein cave in South Africa that dates to A. africanus times. The individual came to be known as "Littlefoot" (STW 573) because its foot was discovered early on before the rest of the skeleton was dug out of the rock. It is still being meticulously cleaned with airscribes and chemicals. However it is clear that Littlefoot will eventually be revealed as the most complete specimen of an early hominin on record. Named "surprise" in the local Afar language for its intriguing combination of traits, A. garhi is known from a single site in Ethiopia called Bouri in the Middle Awash. It dates to 2.5 Mya and was announced by Berhane Asfaw, Gen Suwa, and Tim White in 1999. The A. garhi bones are a significant find because at this time period in the East African hominin fossil record, there are very few nonrobust australop-iths, and also this is about the time early Homo was just starting to evolve there. A. garhi is known from a skull and some postcranial bones. The skull has a sagittal crest and a cranial capacity of 450 cc. The maxilla is surprisingly large and robust. It has primitive frontal, facial, and subnasal (below the nose) morphology relative to A. africanus and early Homo. The teeth are like giant early Homo teeth. The incisors are more similar in size to the molars compared to earlier australopiths—a condition which is also more humanlike. 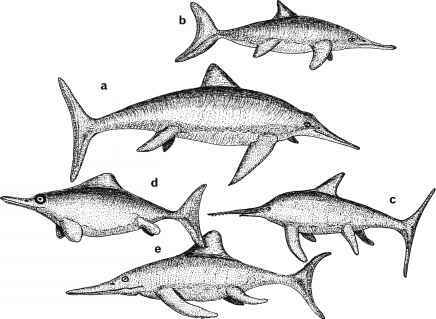 The limb bones indicate A. garhi had small stature like earlier australo-piths. However they were more muscular since the muscle attachment sites on the bones are larger. The limb proportions show that A. garhi had relatively long forearms like earlier australopiths, yet the femur was much longer, a bipedal adaptation shared by Homo. The Bouri remains document the earliest-known increase in femur length, which points to clear selection for more efficient bipedality. The proportions are a mosaic of ape and human morphology since the ratio of humerus to radius/ulna is ape-like, but the ratio of humerus to femur is humanlike. Faunal remains from Bouri have stone tool cut-marks but there are no stone tools from the site. Not only is A. garhi the first hominin to have longer legs but it is also the first to be associated with the use of tools to procure highly nutritious marrow from animal bones.